EcoSikh among faith-based groups who led vigil. WASHINGTON, DC: Dozens of representatives of various faiths gathered in front of the White House on Sunday night to demand action on climate change from President Barack Obama and UN officials, who are currently meeting in Lima, Peru, to discuss action on climate change. The vigil, named “Light for Lima,” which references the UN climate change talks in the Peruvian capital, was organized by two faith-based organizations, OurVoices.net and Franciscan Action Network. 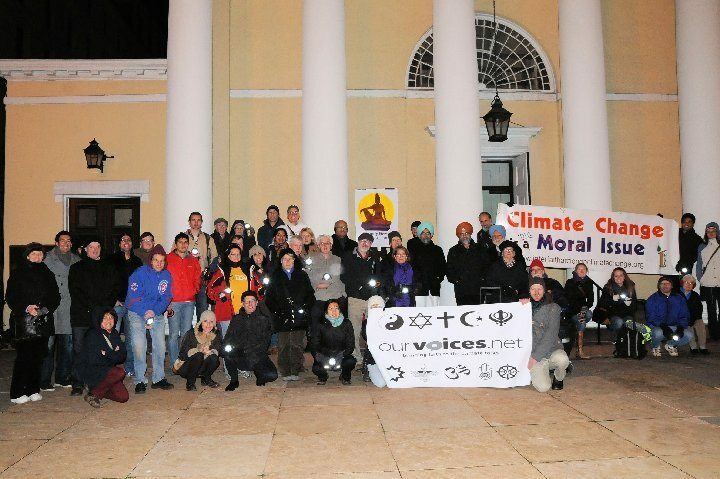 Representatives of Baha’i, Buddhist, Christian, Jewish, Muslim, Sikh and other faiths, who attended the event braving the cold weather, sang and prayed, calling for environmental action and climate justice. “There is overwhelming evidence that 2014 will go on record as the hottest year on record and that this trend will not reverse itself without urgent and immediate action,” said Dr. Rajwant Singh, the President of the group EcoSikh, who spoke at the event and led participants in singing. Other speakers included Dr. Sayyid M. Syeed of the Islamic Society of North America, Jamie Konopacky of the Baha’is of the United States and Patrick Carolan of the Franciscan Action Network, who coordinated the vigil. Solar powered lamps were lit at the vigil. OurVoices.net said for each lamp used in such vigils, the international charity SolarAid will provide two lamps to African rural communities for children to study and read. They will replace kerosene lanterns that “fill poor households with noxious fumes, leading to thousands of deaths annually,” it said. The event was part of a number of vigils in major cities across the world, including London, Jerusalem, Tokyo, Sydney and several cities in the United States. The talks in Lima, which began on December 1, is scheduled to conclude this Friday.